Consumers are increasingly seeking foods that are rich in dietary fibre and wholegrains, but are often unwilling to compromise on sensory quality. Fibre-rich and wholegrain food reviews key research and best industry practice in the development of fibre-enriched and wholegrain products that efficiently meet customer requirements. Part one introduces the key issues surrounding the analysis, definition, regulation and health claims associated with dietary fibre and wholegrain foods. The links between wholegrain foods and health, the range of fibre dietary ingredients and a comparison of their technical functionality are discussed, as are consumption and consumer challenges of wholegrain foods. Part two goes on to explore dietary fibre sources, including wheat and non-wheat cereal dietary fibre ingredients, vegetable, fruit and potato fibres. Improving the quality of fibre-rich and wholegrain foods, including such cereal products as wholegrain bread, muffins, pasta and noodles, is the focus of part three. Fibre in extruded products is also investigated before part four reviews quality improvement of fibre-enriched dairy products, meat products, seafood, beverages and snack foods. Companion animal nutrition as affected by dietary fibre inclusion is discussed, before the book concludes with a consideration of soluble and insoluble fibre in infant nutrition. 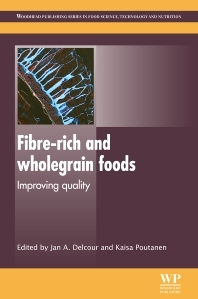 With its distinguished editors and international team of expert contributors, Fibre-rich and wholegrain foods provides a comprehensive guide to the field for researchers working in both the food industry and academia, as well as all those involved in the development, production and use of fibre-enriched and wholegrain foods. Jan Delcour is Professor and Head of the Laboratory of Food Chemistry and Biochemistry and Chairman of Leuven Food Science and Nutrition Research Centre (LFoRCe) at KU Leuven, Belgium.